Oh, yes, I am their target audience. After weeks of careful study of the catalogs, I move on to the websites. 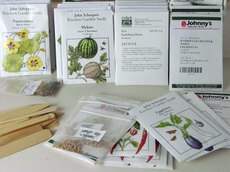 I spend hours in front of the computer with a browser tab open to each of my favorite seed companies: Baker Creek Heirloom Seeds, The Cook's Garden (which was started right here in Londonderry; I even did some work on their catalog way back when), John Scheepers, and Johnny's Selected Seeds. While there are some overlaps, each has a different specialty, so I flip back and forth between the sites and pick and choose and try to spread my orders evenly around. Just sorting through the packets when the orders arrive is thrilling, making piles of which to start first indoors, which can wait, which will be planted directly outdoors. Tomatoes, peppers, eggplants, onions – they all need to be started 8 to 12 weeks ahead of planting time, while herbs and cauliflower only need 4 to 6 weeks. I only like to give squash and cucumbers about a 3 week head start, and salad greens, beets and carrots go right into the dirt in the garden beds. We've rigged up a nifty sort of greenhouse for starting seedlings, based on a Metro shelving unit we picked up at Costco a few years ago. It can be a little pricey, but Costco was selling a package deal for $75: a 7' x 4' x 18" set-up, complete with 5 shelves and heavy-duty casters. Perfect for seed starting: each shelf will fit 4 seed flats with a tiny bit of overlap front and back. 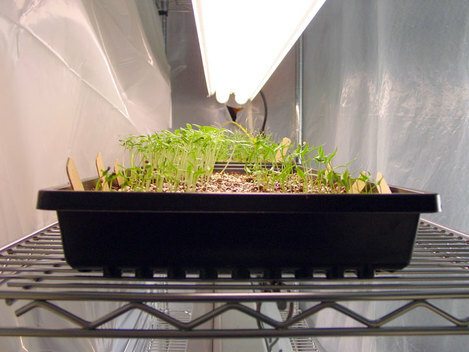 4-ft. fluorescent shop light fixtures fit perfectly end to end, hung from light steel chain on small hooks, so they can be easily raised as the plants grow. Special Gro-Lite bulbs are very expensive, but if you fit one standard warm fluorescent tube and one cool tube, you achieve the same spectrum at about a third of the cost. A single work light with a 100W incandescent bulb, clamped below the bottom shelf, provides just enough warmth to keep the environment at 70 – 75°F. The lights are all on a timer, so the plants get 12 hours of light each day. (Actually, I need to up it at this point, or the plants will all start reaching for the windows when the lights go out at 6PM.) The whole shelving unit is wrapped in heavy-duty plastic to keep heat and humidity in. It's a rather ingenious arrangement, and it works like a charm. That's just my first flat of seedlings – tomatoes, peppers, eggplants. The photo was taken over a week ago; the tomato plants are big enough now that I need to transplant them into their own cells soon. The others won't be far behind. 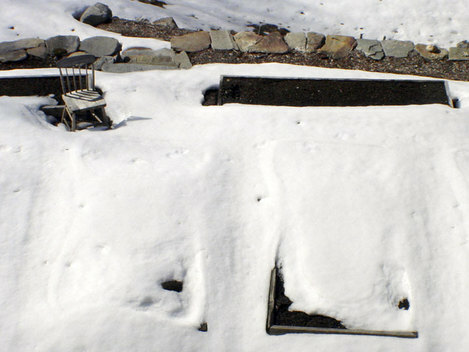 If the snow all melts and the weather stays warm enough, I may be able to seed some greens and root vegetables before we leave for vacation in a couple of weeks. When we get back, it'll be time to start porting all the little babies outside everyday to harden off before they go in the dirt. How wonderful! I try my best to grow what I can on my little London balcony. I have tomatoes, potatoes and herbs so far. You are so lucky to have so much room! Potatoes on the balcony? Good for you...we haven't quite gotten them right, even with all this dirt. We'll try again this year, of course. TJ is planning on building us a root cellar...we'll need some roots to store in it!